After viewing the movie, “Cesar Chavez: An American Hero,” and reading reviews about it, many have asked me; what I thought about the movie? First, some of the reviews already written about the movie are positive, but those about Chavez appear critical and negative. The indefensible: Chavez, his cronies and the union itself were essentially surrogates for the Immigration and Naturalization Service, more concerned with maintaining leverage than protecting human rights. So back to the question; what did I think about the movie? As a Chicano activist and a firm believer in historical self-determination, the movie was “well intended,” much like Miriam Pawell’s epic book, The Crusades of Cesar Chavez. But the facts remains that both were not created by people (Chicanos) that suffered and experienced the historical issues/problems detailed in the movie or book. The movie, in reality, is just another Hollywood production intended to make money; unfortunately at the expense of our peoples’ history. The first question that came to my mind was with 55 million Chicanos/Latinos, and a $1.2 trillion dollar annual consumer market in the U.S., why didn’t we make the movie? My most strident criticism however was over the insidious failure of the movie in not presenting how Cesar Chavez historically affected this nation of 55 million Chicanos/Latinos. Sadly, but more importantly was what the movie manifested about the 55 million Chicanos/Latinos in the U.S.…total social, economic and political powerlessness! A powerlessness (in my opinion) caused by a lack of historical understanding and political in-astuteness that has regressed the hard-won social, economic and political gains of our peoples’ back to the 1950’s. This condition was documented by ABC reporter, Juan Quinoñes in interviews made about the movie. 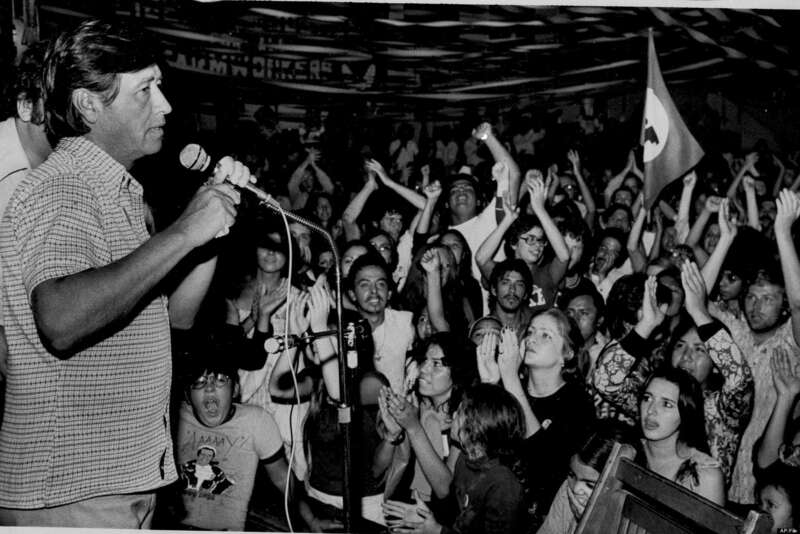 When Quinoñes questioned farmworkers about who Cesar Chavez was, most did not know! On top of that, a large number of our people think that Cesar Chavez… is the great Mexican boxer, Julio Cesar Chavez! In Hollywood terms ($) the movie is a flop. If one considers the following… Chicanos/Latinos represent the largest movie-watching demographic in the U.S. representing 18% of the movie-going audience and purchasing 25% of the tickets sold. If just 10% of all Chicanos/Latinos in the U.S. would have seen the film it would have grossed $47.7 million at the box office, more than quadrupling the amount it cost to make ($10 million). So who made it a flop, and who could have made it successful? In the movie, Chicano historical leaders that helped rally the Chicano community to “La Causa” were omitted. Such Chicano leaders as: Humberto “Bert” Corona, Ernesto Galarza, Abe Tapia, Rodolfo “Corky” Gonzales and numerous others. What then about the negative charges made against Chavez? An old saying states, “Chicanos/Mexicanos love their heroes, but require one thing of their heroes, they must be dead… so our people can paint them anyway they see fit.” In Chavez’s case, some claim he was a saint, others that he was paranoid, dictatorial, tolerated no dissent, a cult leader, a surrogate of the INS/Border Patrol, disdainful and distrustful of educators, the middle class, undermining – leadership from the farmworkers, and finally destroying the UFW. My opinion is that history (written by our people) will judge the charges. The truth is Chavez was a mortal man like other historical leaders that came before him, who in their times did some things right and some things wrong. If the farmworkers’ issue/problem is still with us (after Chavez), remember so are most of the historical issues/problems from the Spanish Conquest of 1519. The one thing that no one can deny in 2014 is that Chavez, at great sacrifice and against gargantuan odds, did his part in our peoples’ historical struggle. His greatest victory was in bringing down the powerful agri-business farmers and corporations (for a time) that for the last 100 years (to the present) continue to exploit Mexican labor. When placed in historical context, Chavez’s victory would be tantamount to this nations’ 55 million Chicanos/Latinos in 2014; politically forcing the U.S. INS/Border Patrol to stop arresting and deporting Mexicans! Finally the question that the movie failed to raise remains…what was Cesar Chavez’s impact and effect on Chicanos/Latinos in the U.S.? A population that has increased from 7 million in 1970, to 55 million in 2014 and is projected by the U.S. census to increase to 134 million by 2050. It is a question that can only be answered by history; written by an educated, politicized and organized people. Herman Baca is a Chicano rights activist and printer known for his community-based grassroots organizing, especially for civil rights and political and judicial equality. He is president of the Committee on Chicano Rights (CCR). Currently, the UC San Diego Library is digitizing Baca’s collection of chronicling more than 40 years of San Diego’s Chicano movement.